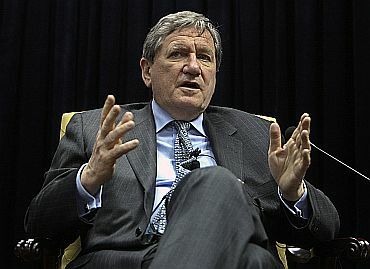 Mourning the death of Richard Holbrooke, the United States special envoy to Af-Pak region, President Barack Obama on Tuesday described him as one of the true giants of American foreign policy who has made the country stronger, safer and more respected. Holbrooke, one of Obama administration's best known diplomat, died on Monday night, three days after he fell while at work and was admitted to the intensive care unit of the George Washington University Hospital. He underwent a surgery on Saturday to repair a tear in his aorta and another procedure on Sunday. Despite the best of the efforts of the doctors, Holbrooke, 69, could not be saved. His death comes on the eve of the crucial monthly Af-Pak situation room meeting at the White House to which he was a permanent fixture in this administration. The annual Af-Pak review is scheduled to be announced on Thursday; in which he played a key role. At the time of his death, Holbrooke was surrounded by his wife, Kati, his sons David and Anthony, his step-children Elizabeth and Chris Jennings, his daughter-in-law Sarah, and the rest of their family. Acknowledging the role of Holbrooke in the present Af-Pak policy, Obama said the progress that the US has made in Afghanistan and Pakistan is due in no small measure to Richard's relentless focus on America's national interest, and pursuit of peace and security. "He understood, in his life and his work, that our interests encompassed the values that we hold so dear. And as usual, amidst his extraordinary duties, he also mentored young people who will serve our country for decades to come," Obama said. "One of his friends and admirers once said that, if you're not on the team and you're in his way, God help you. 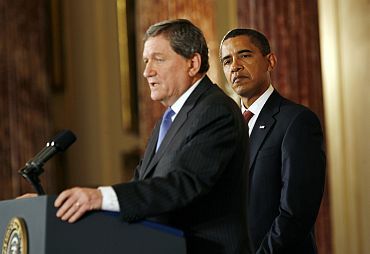 Like so many Presidents before me, I am grateful that Richard Holbrooke was on my team, as are the American people," Obama said. 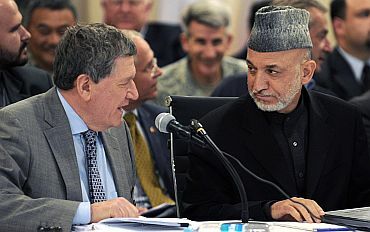 "Richard Holbrooke was a larger than life figure, who through his brilliance, determination and sheer force of will helped bend the curve of history in the direction of progress. He touched so many lives and helped save countless more. He was a tireless negotiator, a relentless advocate for American interests, and the most talented diplomat we've had in a generation," said US Vice President Joe Biden. 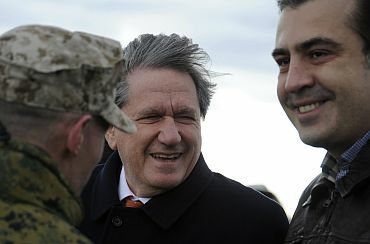 True to form, the Secretary of State, Hillary Clinton, said Holbrooke was a fighter to the end. "His doctors marveled at his strength and his willpower, but to his friends, that was just Richard being Richard. I am grateful for the tireless efforts of all the medical staff, and to everyone who sat by his side or wished him well in these final days," she said. "He was one of a kind -- a true statesman -- and that makes his passing all the more painful," Clinton said in a statement. "From his early days in Vietnam to his historic role bringing peace to the Balkans to his last mission in Afghanistan and Pakistan, Richard helped shape our history, manage our perilous present, and secure our future. He was the consummate diplomat, able to stare down dictators and stand up for America's interests and values even under the most difficult circumstances," Clinton said. He served at every level of the Foreign Service and beyond, helping mentor generations of talented officers and future ambassadors, she said. Few people have ever left a larger mark on the State Department or our country, Clinton added. From Southeast Asia to post-Cold War Europe and around the globe, people have a better chance of a peaceful future because of Richards lifetime of service, she said. "From brokering the Dayton Peace Accords that ended the war in Bosnia, to serving as the US Special Representative for Afghanistan and Pakistan, his knowledge and experience was immense and his insight into global affairs was indispensable. My thoughts and prayers are with his family," said Steny H Hoyer, the House Majority Leader. "Richard was an outsized personality who never tired of tackling the toughest challenges," said Senator John Kerry, Chairman of the Senate Foreign Relations Committee. "Wherever chaos and violence threatened American interests and human lives for nearly a half century, wherever there was a need for courage and insight, Richard Holbrooke showed up for duty," Kerry said. 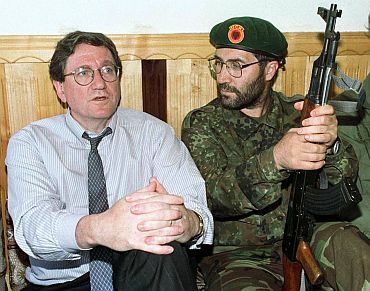 "In a lifetime of passionate, brilliant service on the front lines of war and peace, freedom and oppression, Richard Holbrooke saved lives, secured peace, and restored hope for countless people around the world," said former US President Bill Clinton. Senator Joe Lieberman said Holbrooke was a colossus of American diplomacy; while Congresswoman, Ileana Ros-Lehtinen said Holbrooke has been a dynamic force in American diplomacy for more than five decades.